A better look at the base of Scarlet Moon Hall. A door piece is used to represent the (blocked by rubble) door at the base of the tower. A larger, double door would have been more appropriate but isn’t possible with the available terrain pieces. 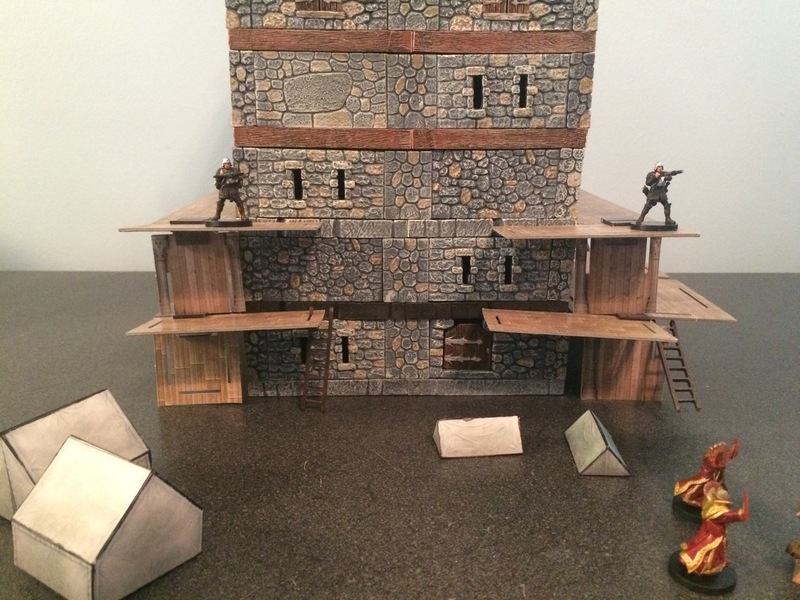 Although ideally the exterior of the terrain pieces that serve as the floors for each level would be stone gray, in the photo you can see a mixture of stone (gray), wood (brown), and unpainted (black). This is a result of the terrain pieces needed for specific floors–the all wooden-floors of the upper levels have a wood border on the outside. The ruined floor used for part of the 3rd floor have a stone exterior paint job.